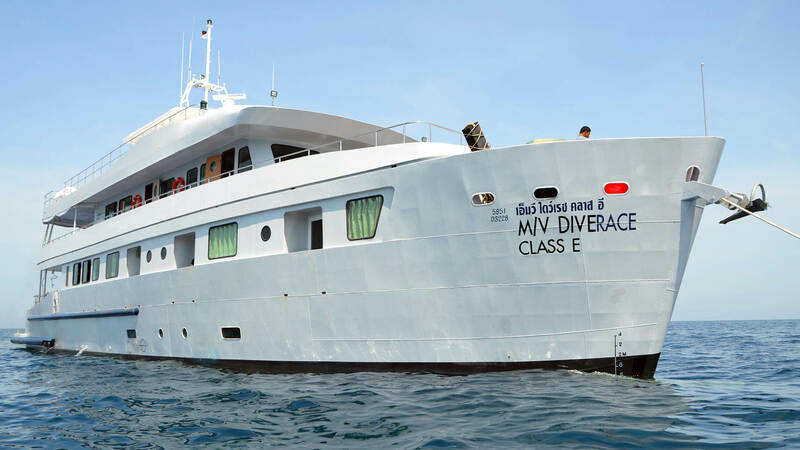 MV DiveRACE Class E is a new Thailand liveaboard which was launched in April 2015. There are trips to the Similan Islands and Richelieu Rock, plus some longer trips that also include Hin Daeng and Hin Muang. She takes 20 divers in 10 cabins, all with aircon and bathroom. There are 6 deluxe cabins on the main deck, which can be double or twin bed configuration, and there are 4 standard twin cabins on the lower deck. This is a large, modern boat with great service and comfort levels. DiveRACE Class E will give you a top quality liveaboard experience. DiveRACE Class E - Breakfast Time! DiveRACE Class E is one of the most modern and stylish Similan Islands Liveaboards. 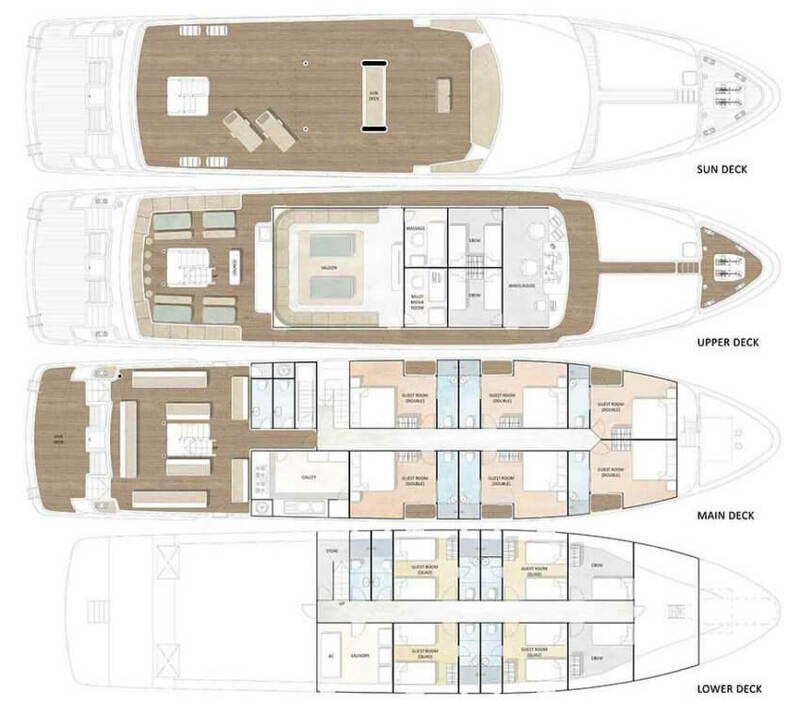 There are 10 cabins in total and this large boat takes up to 20 divers. There are 6 deluxe cabins on the main deck which can be double or twin, and all have a large window, aircon and en suite bathroom. On the lower deck are 4 standard cabins, which have 4 beds (2 bunks) per cabin – each cabin is only for 2 people, but if you want to 3 or 4 share you can do that also. These cabins have aircon and bathroom also. All cabins have daily cleaning and fresh towels provided every day too. DiveRACE Class E is one of the newest liveaboard boats in Thailand, operations started in 2015. It’s a very large, comfortable vessel with lots of space. There’s a large indoor aircon saloon where movies or videos of the day’s diving are shown. There is also plenty of outdoor relaxation space with a covered dining area and big sundeck. 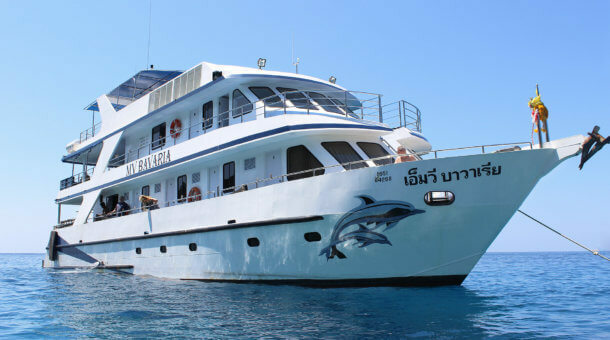 Rental equipment is provided by Sunrise Divers for our divers on the DiveRACE Class E liveaboard. Rental price is 500 Baht per day for a set (BCD/regulator/fins/mask/wetsuit) and 250 Baht per day for a dive computer. We have a large equipment room at our dive center with 30 sets of Aqualung BCDs and regulators and a large selection of long and short wetsuits, open heel and full foot fins. Torches for night dives are 350 Baht per day. 15 liter tanks are extra 250 Baht per day. Nitrox is available on board @ 300 Baht per 12 liter tank fill or 450 Baht per 15 liter tank fill. 1 free Nitrox tank for every 6 paid. PADI Advanced Open Water course is 8,500 Baht. PADI Enriched Air (Nitrox) course is 7,500 Baht. Drinking water, coffee, tea included. Sodas are 40 Baht. Local beers are 80 Baht. Bottles of wine are 1,000 Baht. DiveRACE Class E runs trips for 4 nights to the Similan Islands, Koh Bon, Koh Tachai and Richelieu Rock plus some early season 4 night trips to Hin Daeng and Hin Muang and some 5 night trips covering both dive areas. NOTE : For itineraries including Phi Phi, please contact us. Trips can depart from / return to Phuket or Khao Lak. We’ll give you the correct information by email to ensure you are in the right place for hotel transfers!